Our camara Maxim Han has translated a part of the wikipedia’s article “List of capoeira techniques” into Chinese. This part contains Chinese explanation of defensive movements such as Cocorinha, Esquiva, Resistência, etc. This is the first translation in Chinese. Hope it will be useful for all capoeiristas all across China. 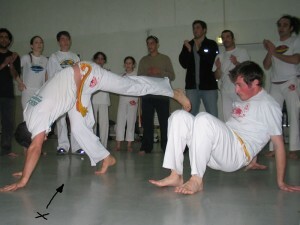 List of capoeira techniques. For the first time in Chinese! Our camara Maxim Han has translated a part of the wikipedia’s article “List of capoeira techniques” into Chinese. This part contains Chinese explanation of basic movements such as ginga, aú, balança, cadeira, bananeira, macaco, negativa, rolê, etc.